Temporary Fencing Hire and Sale : "On Time, Every Time"
Temporary pool fencing is required during the construction of swimming pools or spa pools, or until a permanent pool fence has been installed. GHL Temp Fence is the preferred supplier of temporary pool fencing for hire and sale to several of the market leading pool companies, landscapers and pool fence installers. 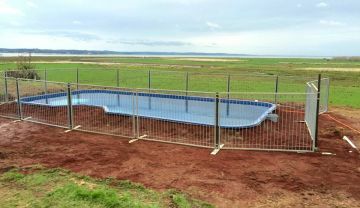 We have several kilometres of temporary pool fencing available and we are the largest temporary fencing specialist supplying the Auckland area. Our temporary pool fencing is distinctively designed to prevent children from entering a pool or spa when filled with water. We also have available a self-closing pool gates for convenience so your swimming pool can be enjoyed safely. Our temporary pool fence conforms to the New Zealand Swimming Pools ACT 1987– Swimming Pool Safety – Safety Barriers for Swimming Pools. Keep your kids and the public safe by erecting a safety perimeter around your swimming pool. 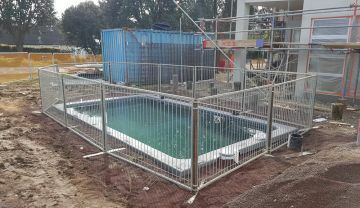 Ensure you are fully compliant with all the various regulations and building permits by erecting a temporary pool fence around your swimming pool during the construction or refurbishment of your swimming pool, spa pool or existing swimming pool fence. Our swimming pool temp fence has been designed so it is simple to install and dismantle, whilst being very solid and secure. All panels and feet are fully hot dipped galvanised and on average exceed New Zealand standard minimum 42 microns. We sell what we hire. Residential Temporary Fencing, Commercial Temporary Fencing, Infrastructure & Civil Temporary Fencing, Event Fencing and Crowd Control. On soft surfaces a foot isn’t necessary and we can supply a longer Star Picket that can be driven in to the ground reducing the overall cost. 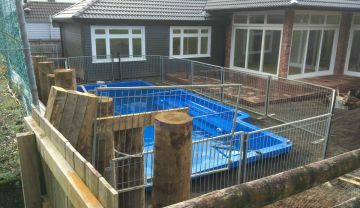 We are an NZ pool fencing hire business servicing from Mercer to Mangawhai including Auckland, Franklin, Counties, Waitakere, Hibiscus Coast, Eastern Suburbs Franklin, Manukau, East Auckland, West Auckland, Auckland CBD, North Shore, and Rodney District.